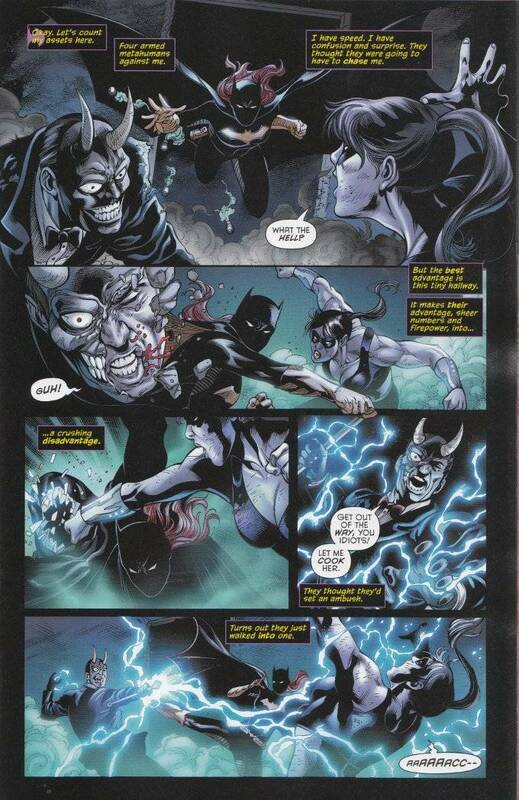 There is little I can say about Batgirl #26 that I have not said before in earlier reviews of this series. I could talk at length about how writer Gail Simone has built the current storyline to a glorious climax that has seen Barbara Gordon hunted by her own father and now leaves her as his only hope of surviving an attack by four metahuman assassins, who all have their own bones to pick with Batgirl. But that would just be recalling the plot and would tell you little about the series itself. I will say this. If you enjoy stories of a smart, canny heroine who is able to overcome tremendous odds through her courage and intelligence, you will enjoy Batgirl. This issue does a fine job of showing how Barbara Gordon is far more than just a distaff Dark Knight. She is a character unto herself and a great heroine. Batgirl is blessed with an equally amazing art team. Daniel Sampere is one of the most underrated pencilers working in the industry today, by my reckoning. Sampere's style is detail-oriented without being overly complex. The inks of Jonathan Glapion perfectly enhance Sampere's pencils, creating just the right amount of shadow to evoke the proper dark mood for the proceedings.